Property Size 1,442 sq. 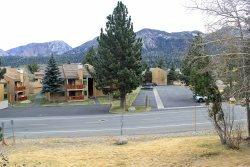 ft.
Standard, Two Bedroom with Loft & 3 Bath condominium located walking distance to the Canyon Lodge Ski Lift Area. Sleeps 8. Each bedroom has 1 queen bed and a Flat Screen TV/DVD Combo, the loft has 1 king bed and a 47" flat screen TV and Blu Ray Player. There are 2 twin roll-a-way beds in the unit that are stored in the bedroom closets. There is also a La Cross queen sofa sleeper in TV alcove area that has an extra long, extra thick mattress; made in USA. Additional TV/Bar Area adjacent to living room also has a 40" flat screen TV with Blu Ray Player. The unit has a total of Four TVs, two VCRs, 2 DVD/Blu Ray Players and stereo cass/cd. Phone in unit 760-924-0611. (Aprox. 1300 sq. ft.) Unit has wireless internet access. The unit is 3 levels...you enter from an interior hallway in the Chamonix B Building. The two bedrooms & 2 full baths are located on the first floor, the second floor is the living room, kitchen, dining room and the third floor is the loft. The third full bath is located off the stairwell halfway up to the loft and the loft is enclosed except for the stairwell area. There are 2 outside parking spaces available. Chamonix Recreation room has a large screen TV, reading area, pool table, ping pong, foosball, and business center with fax, copier, computers w/ internet and laptop hook-up. Sauna, hydro spas, seasonal/summer swimming pool & BBQ area. Coin-operated laundry facilities located in the common area near the office. COMPLIMENTARY INTERNET and CABLE TV are provided, however NO REFUNDS will be given for connectivity problems or Internet failure. TOT LICENSE 1968-CX21. 5min walk to canyon lodge Nice recreation room with jacuzzi. I had a comfortable stay at this place. The house is clean and comfortable for a group of six people. Kitchen, although small is well equipped. Overall I had a nice experience staying at this place. I would recommend this place to others. Easy check in. Really close to the entrance. Place was comfortable and had plenty of room. Thanks! Thanks so much, this was so easy and had everything we needed! All the basics were covered, right next to the trolley stop. Very easy communication and check-in. Super convenient location, just a short walk to Canyon! Spacious and comfy for 7-8 folks. End unit makes it quieter and a bit more isolated from the other units. Check in was a breeze, and they were very communicative and helpful with any questions. Will definitely try to stay here next time around! #21 was a bit disappointing. I was not expecting such a dark and dreary condo. I am just being honest. It was a great location, and I have stayed in Chamonix many times. It has all the original stuff from 1970.